Square wasn’t pulling punches when they developed their very first M-rated survival horror game, Parasite Eve. In the opening scene, the main character, Aya Brea, attends an opera where the entire audience spontaneously combusts. But what makes Parasite Eve so unique is that it shares more in common with Final Fantasy than it does other horror games. This post originally appeared 10/29/16. When Hironobu Sakaguchi first began planning Final Fantasy VII, he conceived of it as a detective mystery set in New York. FFVII would end up taking a different direction, becoming the JRPG classic millions of players are familiar with. But those discarded ideas were stored away and shortly afterwards combined with the wildly popular Parasite Eve film to become the PS1 game. Parasite Eve is actually a sequel to the movie of the same name, which was was loosely based on the book by Hideaki Sena. Both the book and film can quickly be summed up as Vertigo with mitochondria. The Parasite Eve game shows the aftermath of mitochondrial experiments that took place years ago and follows NYPD rookie detective, Aya Brea. The science behind the game is fascinating. Mitochondria act as a “powerhouse of the cell,” originally having evolved from bacteria that joined in a symbiotic relationship with our blood cells. In Parasite Eve, the mitochondria want to create an “Ultimate Being” to replace humanity. The mitochondria gives those under its sway a lot of power, such as the ability to set enemies on fire using heat generated from the mitochondria. Aya’s job is not only to stop the rebellious organisms, but discover her past, which comes back to her in flashbacks. Parasite Eve’s horror elements are set dressing for a modern JRPG. Rather, it’s the evolution of the gameplay and visual style from the Final Fantasy games that stand out. The PS1 was an experimental time for Square in which almost every JRPG had a creative twist when it came to combat mechanics. Vagrant Story, Chrono Cross, Front Mission 3, Final Fantasy Tactics, and even Final Fantasy VIII showcased a variety of differing battle systems. 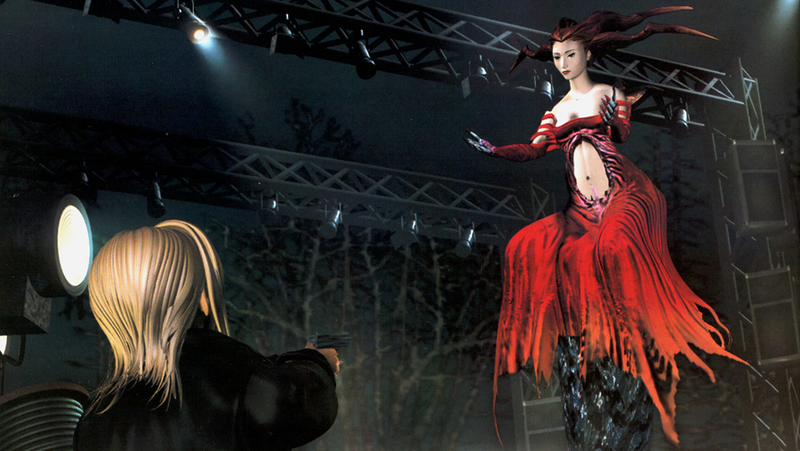 Parasite Eve had combat that nicely balanced turn-based combat with real-time action. There were random battles and a meter similar to Final Fantasy’s Active Time Battle (ATB) that had to be full before you could act. But players also had complete control of Aya, whose positioning impacted the strength and accuracy of her equipped weapon. This gave the game a feeling of immediacy while also necessitating the strategic planning of turn-based battles. The weapon and armor system also combines RPG elements with weapon systems common in many action games. There are a variety of guns, from rifles to grenade launchers, and each has its own set of properties that could be altered with permanent stats boosts. Whereas most games will limit your upgrades to a single weapon, Parasite Eve gives you the ability to transfer those stats to newer, more powerful weapons via tools. The guns can also be updated back at the police station, and the Bonus Points obtained from leveling up can be distributed for enhancements. All of this makes the crafting much more complex than most horror games. Aya has tools besides weapons at her disposal as well. Her Parasite Energy gets unlocked in the opera scene; it’s akin to magic that’s powered by mitochondria. A well-timed Haste and Barrier can turn the tide of the battle, whereas Heals, in conjunction with medicine, help Aya survive. Energy Shots are powerful, but they also leave Aya staggered, meaning she’s vulnerable to enemy attacks. The regenerating Parasite Energy meter adds to the tension as you wait for the bar to rise to the point where you can execute another ability, leaving you helpless until it does. The combination of all these elements results in a truly innovative experience. I honestly can’t think of many other JRPGs that marry these different systems so fluidly together. Final Fantasy VII’s Midgar is replaced by a modern New York, which the mitochondria turns into a scary and magical metropolis. Fossilized dinosaurs come to life in the Museum of Natural History. A giant slime monster (essentially the mitochondrial version of Godzilla) forms from corpses. Whereas Manhattan is usually teeming with people, the attack has forced an evacuation as many of the characters lose someone dear to them. Aya wanders the abandoned streets of Chinatown, navigates the labyrinthine Central Park, and engages in a desperate battle against the humanized embodiment of the mitochondria, Eve, atop the Statue of Liberty. The environments are beautifully rendered, with a grittiness to them reminiscent of the actual city. The sublime score by Yoko Shimomura creates atmosphere that gives New York its own foreboding character and menace. All the challenges and sacrifices still don’t prevent the Ultimate Being from being born. Trepidation seized me as the creature took form. Unfortunately, much of the tension built up so well throughout the game defused as soon as I saw the creature. It looked like a cross between a Roswell alien and Kid Icarus. This was the Ultimate Being? It eventually evolved into a more respectable form, and a string of tough battles ensued. This concluded in a great chase sequence which is one of the most tense moments in the game. Just when the battle seems hopeless, Aya is helped by her colleagues, especially her partner, Daniel, who lost his ex-wife to Eve’s fire earlier in the game. Watching him cope, evolve, and eventually throw himself into harm’s way to help defeat the Ultimate Being was a powerful moment. Together, Aya and company finally destroy the mitochondrial hope for salvation. A big part of Parasite Eve’s draw for me was because it brought back memories of a co-worker. He was a great guy, always imparting words of wisdom, and gracious in his willingness to help. I thought of him as a mentor. Unfortunately, we had a disagreement about a silly matter, and though we reconciled, we weren’t ever as close. A little while after that, I left the company for another opportunity, and unfortunately, lost contact. The next I heard about him, he’d passed away when his house burned down while he was sleeping inside. I was haunted by his death for weeks, couldn’t help but imagine how terrifying it must have been. I still get emotional whenever I think about it. Parasite Eve was like an ember rekindling that memory, a reminder of the chemical fragility of our bodies and the havoc life causes with seeming indifference. I was so hooked to the game because I wanted to see how the characters responded to the opening tragedy. When the villainous doctor supporting Eve mentioned it requires 1600 degrees of heat for a human to “burn and melt,” I felt sick. Unlike the Final Fantasy games with their hopeful endings, Parasite Eve’s storytellers make a sinister implication. There’s a parallel between the deadly defiance of the mitochondria to the destructive effects humanity has on the globe. We are all Parasite Eves, wreaking havoc, possibly even deserving to be replaced. In the final scene, Aya and company watch the same opera from the opening in a cycle meant to show how they’ve changed. But her eyes begin to turn red with mitochondrial power, causing everyone else’s eyes to gleam crimson as well. They’re not burned by it. Instead, either empowered or infected. The ambiguity implies the mitochondria are still there, waiting to emerge. Whether for good or evil is in the hands of humanity.